Completing the fields in the screen under the fourth tab, Payment and billing, will save you a lot of time when you start creating transactions. 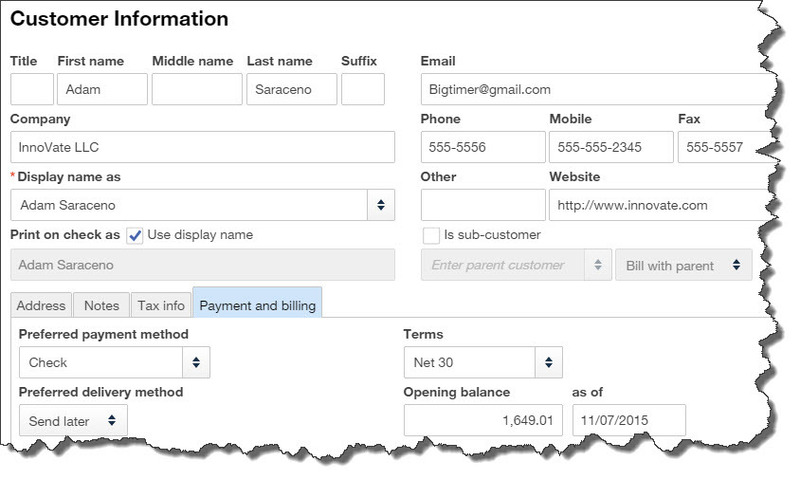 Any of the customer’s current, unpaid obligations should be entered in the field labeled Opening balance…as of. You can also select default (preferred) Terms, payment method (cash? check? credit card? ), and delivery method (print or send later). If you haven’t yet signed up for a merchant account, which lets you accept credit/debit cards and bank transfers, let us tell you what’s involved. You’ll find that invoices are paid faster if a customer can do so electronically.